When God says it – He does it, Bible Prophecies Fulfilled by Jesus by Carine MacKenzie is an excellent addition to our nightly family worship, and a favorite in our 2 ¾ yr-old’s hands. A recommendation of “Read to me” for 5-7 and “Read myself” for 8-11, keeps in perspective the slightly glazed look she gives us during longer “chapters.” Colorful, engaging pictures depicting scenes within the two page long sections are a great talking point throughout each story. Our daughter is excited every time we pick it up, and often sneaks away with it to “read to myself” – her words, not mine! As a parent, the emphasis on Jesus fulfilling Bible prophecies is a wonderful way to witness the story of Christ how God revealed it through the scriptures. The 20 chapters begin with creation; walk through the foretelling of Messiah into the days of Christ, and end with the resurrection and second coming. Being concise, each section is selective in what Old Testament prophet gets mentioned, nevertheless citing quite a variety. 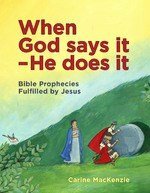 Child tested and approved, appealingly illustrated, and encompassing the story of Christ as told through the prophets – I highly recommend When God says it – He does it!